If you've connected Mailchimp for Shopify, you can view purchase data for your campaigns and individual contacts. Use this purchase data to measure your ROI, track individual product sales and total revenue, share product recommendations, and create segments to target your customers with personalized offers. In this article, you'll learn how to view purchase data in subscriber profiles, campaign reports, and segments. To view purchase data from Shopify, you'll need to connect your Shopify store to a Mailchimp list. Learn how to set up Mailchimp for Shopify. Shopify data on the contact profile and campaign report may not match. Mailchimp for Shopify adds existing orders and customers to your Mailchimp list and contact profiles, but only tracks new activity for campaigns. As a result, some purchase data may be available in the contact profile that doesn't show up in the campaign report. 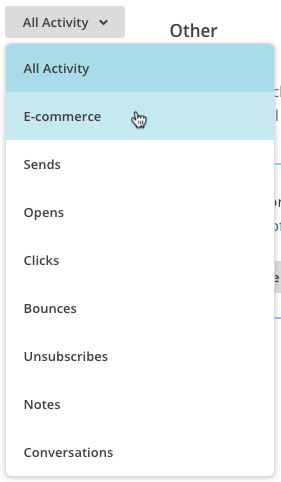 After you connect Mailchimp for Shopify, all Shopify customers who agreed to receive marketing messages from you will be added to your list as subscribed contacts. We'll display each Shopify customer's order history on their contact profile page. To view Shopify purchase information in a contact profile, follow these steps. Click the list the contact is a member of. Click the All Activity drop-down menu and choose E-commerce. If your list is already connected to another e-commerce integration, you'll purchase information for both stores. This other e-commerce data is available for you to view, but can't be used to create segments. If you enabled e-commerce link tracking in your campaign, your report will tell you how much money your campaign generated, the total number of orders received, the average order amount, and a breakdown of each contact's purchases. If you added Product Recommendations, your report will also tell you how many times a product was recommended, how many times a recommendation led to a purchase, and how much revenue your recommendations generated. You can access this information for each campaign from the Reports page of your account. To view Shopify purchase information in a campaign report, follow these steps. Click View Report next to the campaign you want to work with. The report Overview will display the total orders, average order total, and total revenue generated by the campaign. In the navigation bar, click the E-commerce drop-down menu and choose either Product activity or Order history. Product activity shows a list of products sold through the campaign and the amount of revenue generated by each product. If you added recommendations to your campaign, this page will also show you how much money your recommendations generated. Order history displays list of each contact's purchases. Click the View store drop-down menu to filter purchases by connected store. In addition to simply reviewing Shopify data, you can use our segmentation tool to target contacts based on buyer behavior. For example, you might send a coupon to encourage repeat buyers who haven't purchased any products in the past 60 days. You could also combine purchase history with contact ratings to target your most loyal customers who have purchased recently. We also offer a selection of pre-built e-commerce segments in the Campaign Builder. Learn more about how to segment by purchase activity. Shopify product category data is not synced to Mailchimp, so you won't be able to segment by product category. Two e-commerce segmentation options are not available for lists integrated with Shopify: Product (Total # Ordered) and Product (Average # Per Order).